I am a foodie, and I love to try new recipes. My mother taught me this recipe when I was a child, and now I make it with my kids. 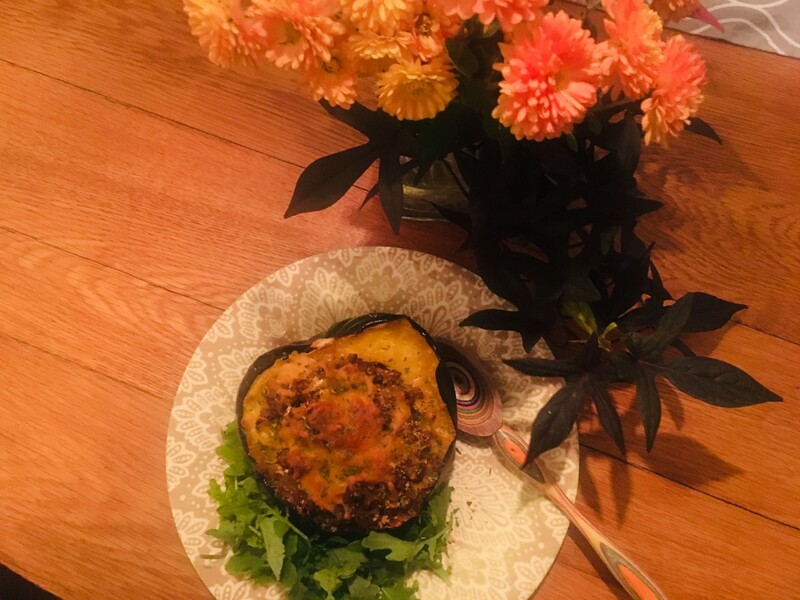 This acorn squash recipe is one I grew up eating in the fall. As it cooks, the spices will fill your home with scents of the season and make you feel ready for picking apples and carving pumpkins. Especially if you live somewhere warm, like I do, this recipe will help you get into the fall spirit—even if the temperature outside doesn't quite agree with you! As this dish bakes, the squash and apples become fork-tender, and the maple syrup provides a delicious sweetness. Additional depth of flavor comes from using both red and green apples; the green variety lends tartness whereas the red variety provides a counteracting sweetness. 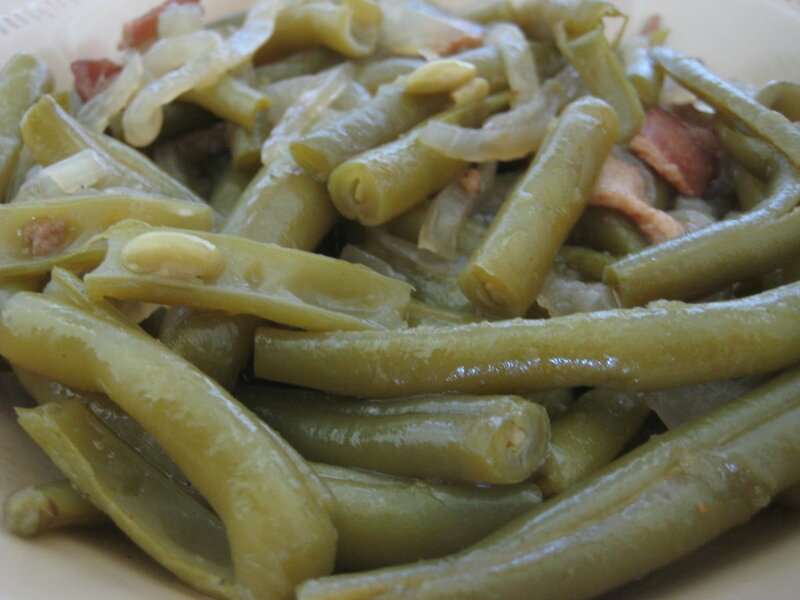 Not only is this side dish flavorful, it is beautiful when served. It could also make a perfect side dish for Thanksgiving. Preheat oven to 350 degrees. 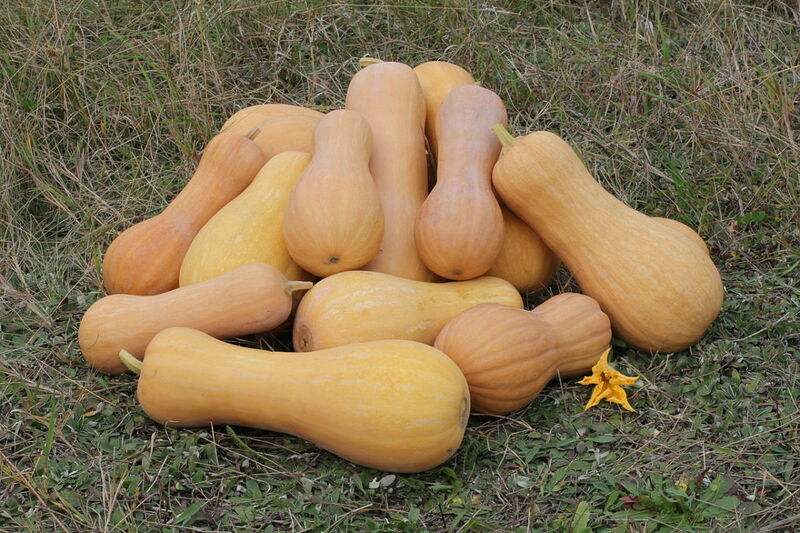 Begin by cutting the acorn squash in half and scooping out the seeds and fibrous strings in the middle of the squash. Save the seeds for roasting. (Bonus recipe at the bottom of this recipe for how to roast the seeds). 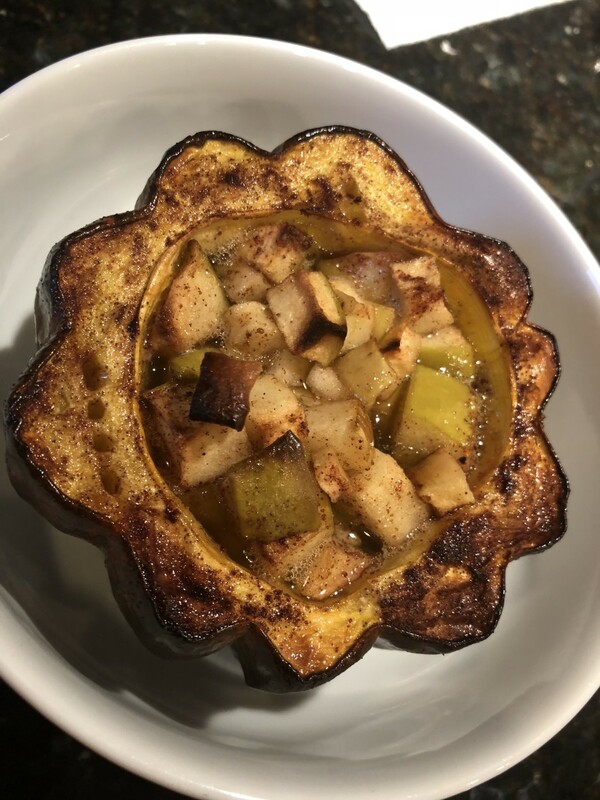 Lightly brush the edges and inner portion of the acorn squash with olive oil and place them cut side up in a small baking pan. Combine all other ingredients in a bowl, except the maple syrup and butter. 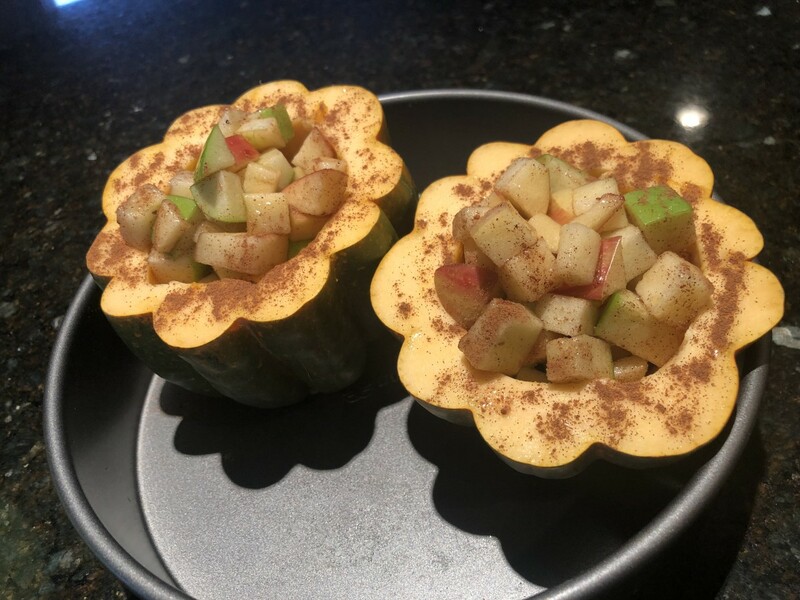 Using a small spoon, scoop apple mixture into the inner portion of the acorn squash. Cut butter into small pieces and place on top of cubed apples. Drizzle maple syrup evenly between the two acorn squash bowls. Add pinch of cinnamon to edges of the acorn squash. 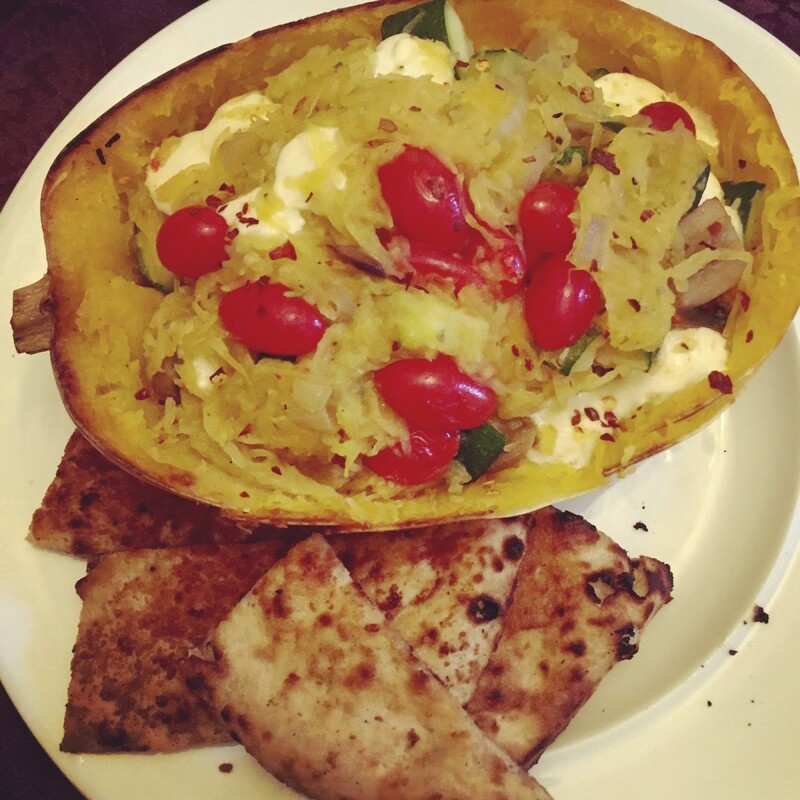 Take care that the acorn squash do not tip over as the delicious juices inside will spill out. 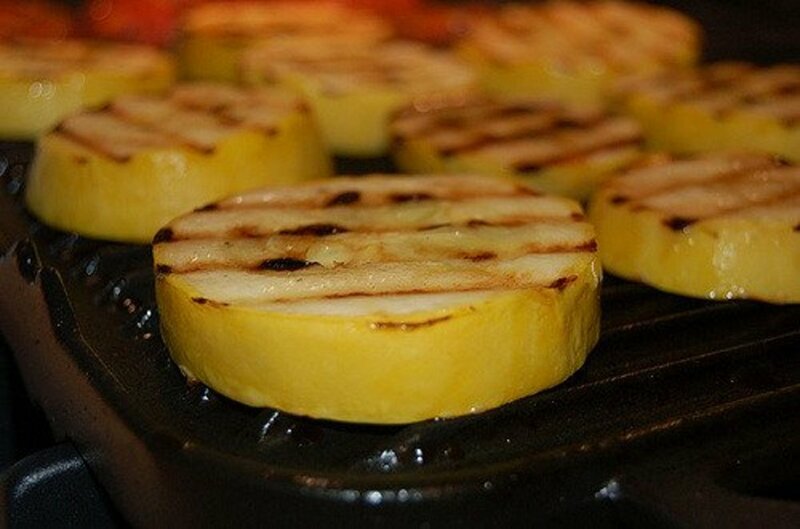 Bake in 15 minute increments until the acorn squash is fork tender. 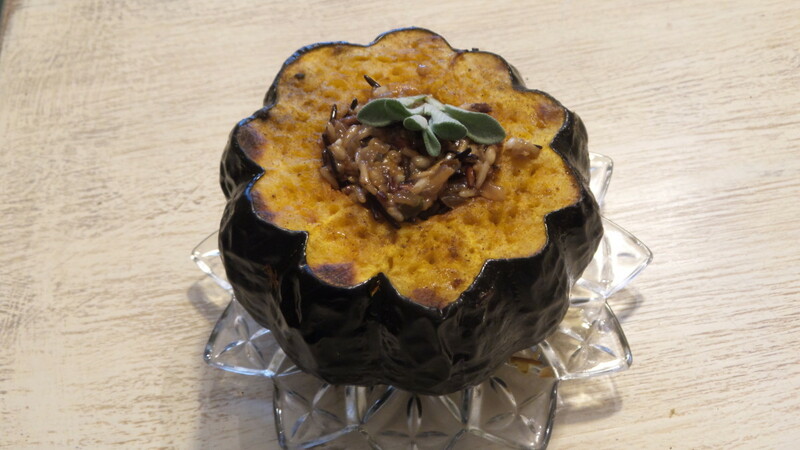 Allow acorn squash to cool for 5 minutes and then enjoy! Cover and keep any left overs in the fridge for up to 5 days. 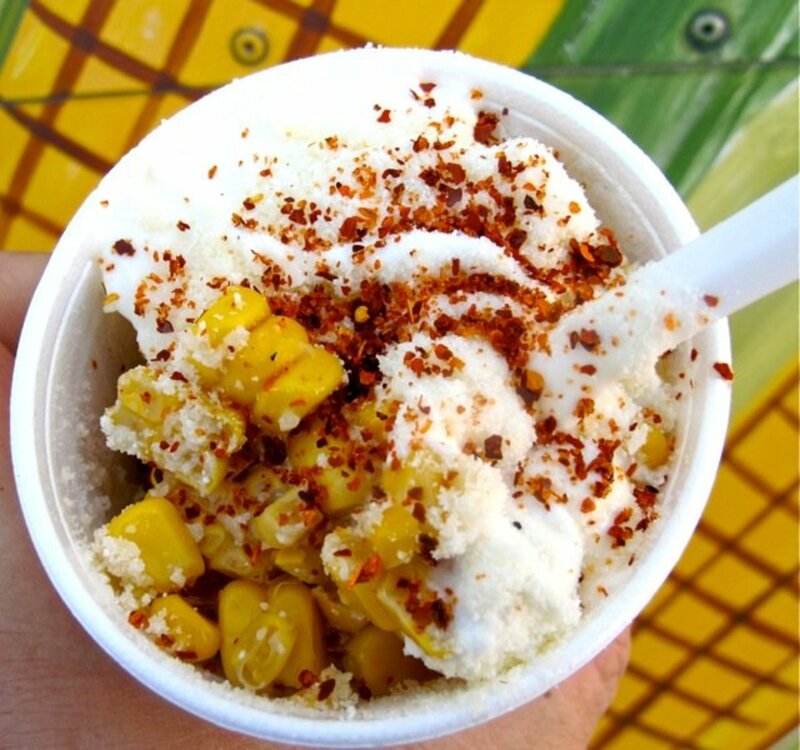 Microwave to reheat or enjoy cold. 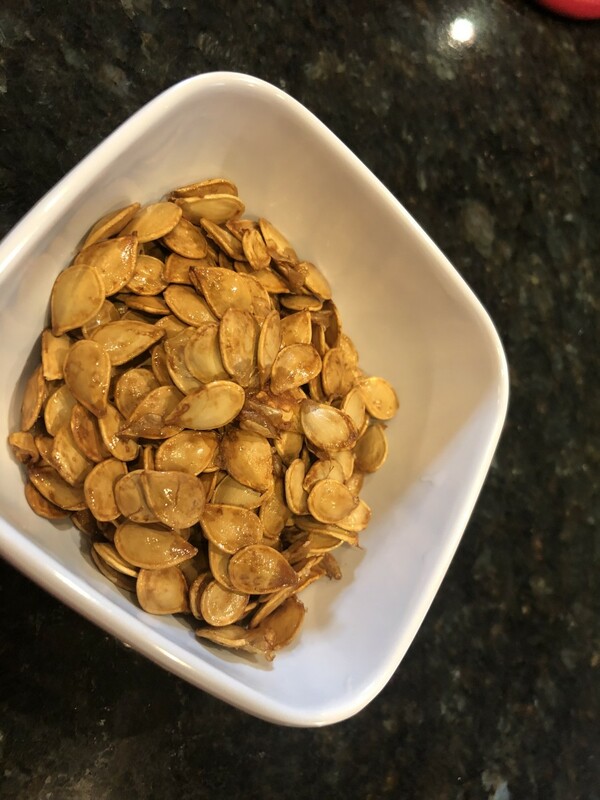 Whenever I prepare squash, I like to take the opportunity to roast the seeds. I make a simple recipe by tossing the seeds in some olive oil and salt and then spreading them out on a baking sheet. By roasting them for a short period of time, the outside of the seeds is crispy and crunchy while the inside is softer. It makes for a good snack while you're waiting for other food to cook, too! Roast the seeds at 350 degrees in 5-minute intervals until cooked. Check the seeds often as they will burn and dry out quickly. At each 5-minute interval, flip the seeds and move them around on the pan a little. Once the seeds have turned a golden color, and before they turn dark brown/black, take them out of the oven to enjoy! Have You Roasted Seeds Before? How lovely to be able to pass the recipe you worked on with your mother to your children! Thanks for sharing it here. It looks positively yum. 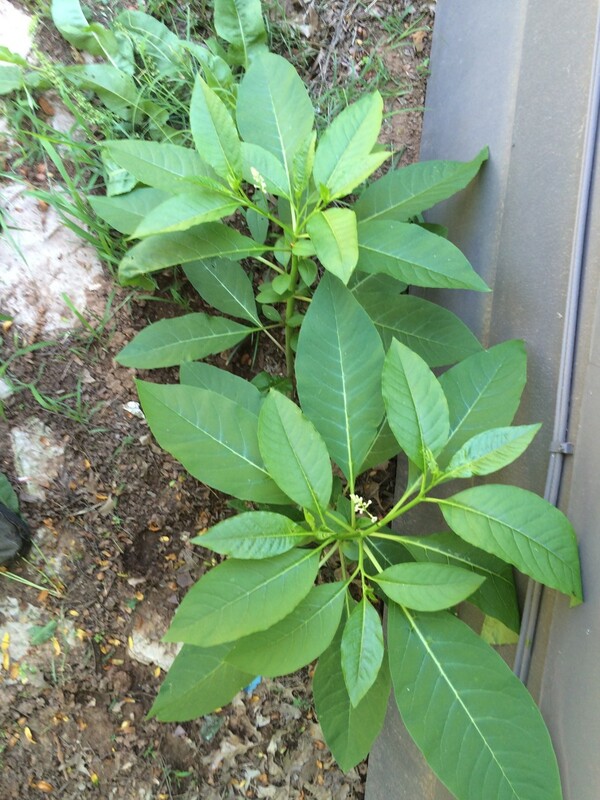 I like the seeds seasoned with salt and curry powder. Hello, Lisa, thanks for sharing. I will do try the recipe because I like to eat new meals for variety and health sake. But the acorn seeds are very nutritious. In my country, we used them to cook a delicious soup. The soup is so popular that no matter what ethnic group one comes from, it is enjoyed. I have other various ways of cooking the seeds like making stew and enjoying them with a variety of carbohydrates such as rice, yam, cocoyam, potatoes, and cornmeal. Many thanks and have a nice day.